When I hear the name Santana I think of tropical colors. Carlos Santana is the Hall of Fame guitarist and bandleader who combines electrified blues guitar and Afro-Cuban rhythms into a groovy, danceable moving blend of music. 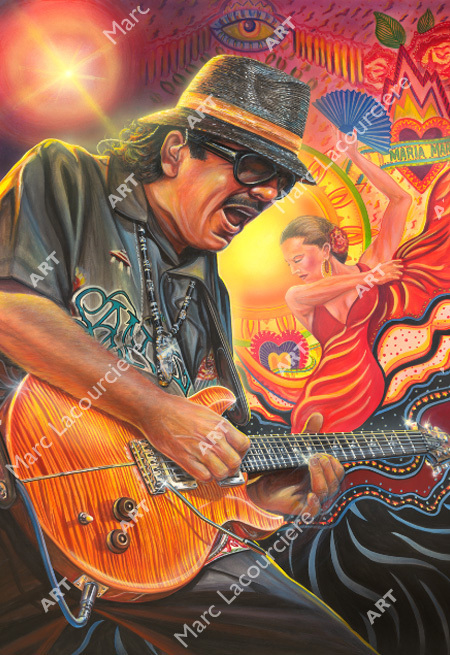 With many successes, in 1999 Santana made a major splash on the charts with the album Supernatural, which featured the hit single “Smooth.” Santana took home eight Grammy Awards for the album, including record of the year, album of the year, best rock album, and five other awards. I thought I would capture him in my painting with a themed dancer, ethnic art graphics to one of my favorite songs Maria Maria.